Posted in: dev blog, love-space. Tagged: gamedev, love-space, screenshot, wip. I’ve been sharing screenshots on twitter but it occurs to me I should post them here as well! 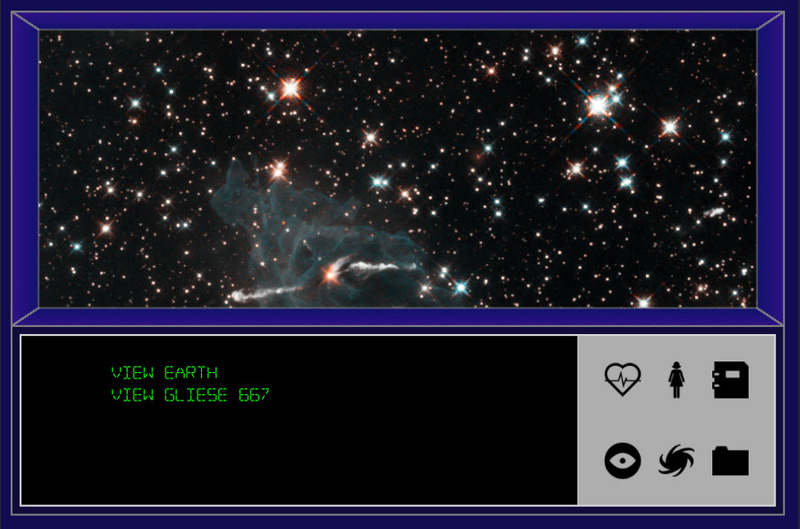 This is the UI for love/space, the game I’m currently working on for the WAG Challenge! Can you guess what the icons on the control panel stand for? I’m building it in Unity3d with Fungus, a neat little asset/scripting package for making visual novels in Unity. In love/space you play a woman who is part of a crew seeking a new home for humanity. Something goes wrong along the way and she’s left alone with an increasingly unreliable AI and memories of the love she left behind. What happened to the crew? Can she fix whatever’s wrong with the ship’s AI? It’s up to you to figure it out! The game will be available on itch.io at the end of the month. Posted in: Uncategorized. Tagged: blogspot, gamedev, python. Currently working on learning some Python, both for my own interest and in hopes that it will prove useful in my career. I decided to start out working on a kind of old school text adventure game. The project is both fun and interesting and already I’ve learned quite a few things (aside from the little bit of Python that I’ve learned from it). Everything that everyone tells you about learning to code is true: you learn more if you have a project you are working on. There are several reasons for this, motivation being the least of them; the biggest reason, in my opinion, is that having a project in mind will push you to stretch the limits of what you know and try new things. The guys who wrote the classic text adventure games were amazingly talented writers. It is really hard to make a game interesting when you are limited to text to convey everything. I’m doing text as a placeholder, but even so, it’s hard to strike the balance between evocative and tl;dr. The more details you have fleshed out about your setting & characters, even if you don’t convey 90% of it in-game, the richer your game will be. I started out with a seed idea and haven’t really done a lot of world building yet, and it shows. I’m pleased with the amount of progress I’ve made in a short period of time and I’m looking forward to continuing to work on it. Right now my goal isn’t really to necessarily make something that I can share but mostly to explore some ideas and gain some knowledge of Python; if I do decide to share some of it I’ll post it here. The main resources I’ve been using for this project have been reddit/gamedev and the tutorials at http://inventwithpython.com.